Home Depot always has a fang-tastic selection of Halloween decorations, and this year is no exception. But, perhaps, the greatest offering this year is a new spin on a blast from the past. For the past few years, Home Depot has carried a line of 3-foot animated Halloween figures, very similar to the Telco Motionettes of Halloween. While the designs have always been fun and creative, one piece really stands out this year… The Werewolf! In the history of mass-produced Halloween decorations, there have been many remarkable boxes and packages that have housed decorations both stellar and less-than-stellar. However, there is no artwork that matches this beautifully macabre scene. Behold the morbid and the macabre! What sort of heinous decoration could be housed in such a gruesome box? There are bats, skeletons, zombie hands, graves, mausoleums, and spider webs… and this is only the bottom of the box! Gah! Look at that drooling ghoul in his eternal shroud! And what is that, a toppled cross below him? This must really be some sort of sick and demented decoration. But wait! There’s more! This must be the grimmest of reapers! Look at that snake protruding from his eye socket! He’s even wearing another serpent as a scarf! Could whatever is inside this box be as terrifying as this? Could it ever live up to the utter fear that this image inspires? Behold the Spooky Coffin, released in 1990! For 1990, this probably was a pretty gruesome Halloween decoration: a miniature coffin, a vampire rising from it, creepy creaking sounds, menacing music playing, and evil laughter. Taking all that into consideration, it was pretty advanced for its time. One thing is for certain, they don’t make ’em like they used to… And that includes the packaging! Editor’s Note: Below are some of the most common questions we have received about the Halloween Motion-ettes. This article is a sub-article of The Motion-ettes of Halloween Collector’s Guide. Please review the Guide before reading the FAQ. Q: What’s the big deal about Telco? Why not create a guide for Topstone or early Gemmy Halloween figures? A: The Big Scare has plans to produce, at least, one article focusing on the other brands of tabletop animation. The reason we started with Telco is because, as a company, its offerings were extremely expansive, yet incredibly underdocumented. Twenty-five years later, there is a lot of confusion about the line and very little information. 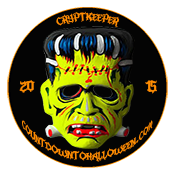 This has led to misunderstandings in the worlds of collectors and Halloween enthusiasts alike. While the folks behind The Big Scare own relatively few Motion-ettes, we love their charms and the fact that they represent a simpler time in the world of Halloween. We have spent the past decade gathering information, comparing photos, and assembling a cohesive history of the line. To us, it was an endeavor worth the while. Q: My Telco Halloween Motion-ette is dated 1987 (or 1986). That’s all I need to know about the year o f its release, right? A: Unfortunately, no. Simply because your Motion-ette is dated 1987 (or 1986) doesn’t mean it is from that year. Telco was notorious for stamping misleading dates on Motion-ette heads, hands, and boxes. 1986 refers to the creation of the Halloween line, while 1987 simply refers to the (true) national launch of the Halloween figures and the introduction of a particular body type. All Motion-ettes of Halloween are somehow tied to 1986 or 1987. If your figure has a 1986 or 1987 date, it most likely isn’t from that year… especially if it’s a bug-eyed Devil or a Green Werewolf (Beastman). Neither was released until years later. But that’s why we created the Motion-ettes guide! Q: I found a Motion-ette that has a very different costume from the ones I see pictured on this site. Did I stumble upon a rare figure? A: All images in our guide are photographs of archival catalog and stock images, intended to educate Halloween enthusiasts on what the actual original products looked like. So, chances are, if your figure has a different costume from what is outlined in the guide, you probably stumbled upon an imposter, at least a partial imposter. Motion-ettes were released at a time when crafting was still at its height. Crafters and hobbyists found Motion-ettes to be quite enchanting — not for their factory-born charms, but for the possibilities of modification and re-sale. Many times, Motion-ette figures were given new costumes, new accessories, or additional lighting features after they were purchased. They were then re-sold at craft fairs for higher prices. So, yes, your Motion-ette find is indeed rare. It’s one of a kind! But don’t go thinking that makes it better than an original Motion-ette. In fact, that probably would appeal less to most collectors. But the only thing that really matters is that you like it! Many of the Motion-ettes altered by hobbyists are very well done. Q: I have a figure that has a nearly identical color scheme to the Motion-ettes in the guide, but the face is sculpted a bit differently, and the accessory is one I didn’t see pictured or mentioned in the collector’s guide. Is it a Telco? A: Probably n ot. It could very well be an EPI animated figure. In fact, we here at The Big Scare are still trying to pinpoint the make of certain lookalikes, especially the ones that really look like they could be Telco Motion-ettes but don’t have any of the standard accessories. The accessories make for one of the best ways to determine the brand of your animated monster. If your figure has the regular skull, the rectangular lantern, or this blow mold pumpkin, it’s probably a Telco, although the pumpkin was also used by lookalike companies. The cobra, crazy bat, and threatening cat blow mold accessories are also extremely indicative that yours is indeed a Telco Motion-ette. Q: I see a lot of these Motion-ettes listed for high prices on [a popular online auction site]. These prices seem a bit excessive to me. Is there a conclusive list of fair market values for the Halloween Motion-ettes? A: No official guide has ever been created, but, during our ten years of research, we kept a log of final selling prices for various figures in the Telco line. We created a range using our recorded statistics. You can find the average price ranges for popular figures in our Telco Halloween Motion-ettes Price Guide. Please note that these prices are based on our collected data and should only be used as one resource when determining a fair price for a particular animated figure. Have a question? Ask it in the comments section, and it could appear above in our official (and ever-growing) Q&A. The following is a sub-article about the economy line of the Telco Motion-ettes of Halloween. To read the full article on the history of Telco and the 24″ line of Motion-ettes, click here. After the initial success of the 24″ line, Telco opted to expand its offerings to a wider consumer base. The 24″ electric Motion-ettes retailed at $69.99, a fairly hefty price for a Halloween decoration in the 1980s. As such, Telco decided to create an economy line of animated figures that could be purchased by Halloween enthusiasts on a budget, thus the 18″ battery-operated Motion-ettes of Halloween were born. The first wave of figures included smaller versions of the original Witch and Vampire, as well as smaller versions of the 1988 Monster and Ghost. This debut line varied greatly from the economy Motion-ettes that followed. The most noticeable difference was the size of the lighted accessory each figure held. The first wave had larger accessories than the versions that succeeded. The second difference was that these figures included AC adapters, meaning that they could be powered by electricity in addition to batteries. There were some minor variations in certain characters as well. The hair on the first edition Witch resembled that of her 24″ counterpart, meaning it was fluffy. She was later given curly hair. It should also be noted that early editions of the Monster came equipped with a skull accessory as opposed to the more traditional lantern. Over the years, the economy line became more standardized. The AC adapters were phased out and the accessories became smaller. The initial four figures continued to be produced and additional ones were added, including a green Beastman and a Skeleton, neither of which had accessories. An alternate version of the Witch was introduced later on. And, at one point, Telco was offering both its original Witch and the alternate Witch. Lighted eyes and “spooky sounds” were trademarks of the 18″ line, with most of the figures coming with the iconic electronic wailing sound that defined Halloween in the early 1990s. 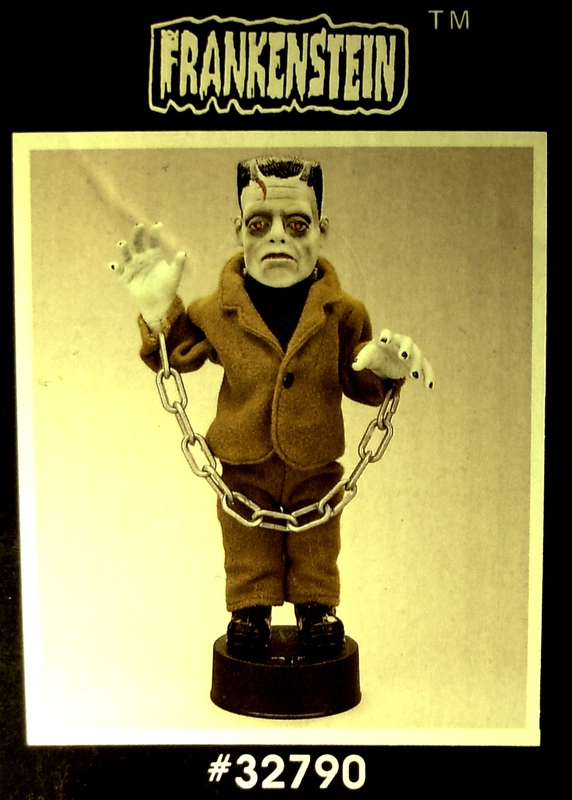 Once Telco acquired a license from Universal Studios, they debuted an 18″ line featuring official Frankenstein, Dracula, Wolf Man, and Creature from the Black Lagoon figures. The Bride of Frankenstein and the Mummy came out the following year, but neither were as big of sellers as the original four. Some retailers carried 16″ variants, which causes confusion among collectors to this day. These figures did away with the lighted accessories, but maintained the lighted eyes. The electronic wailing was replaced with “life-like” laughter, moaning, roaring, and cackling, depending on the character. In 1990, Telco debuted an intermediate line of Motion-ettes, slightly larger than the battery operated counterparts, but much smaller than the 24″ line. These were electric-powered figures and included the aforementioned “life-like” sounds. The Witch, Ghost, Vampire and Monster were part of this special line that is often confused with the other two on the secondary market. To read the main article about the Telco Motion-ettes, the original animated figures of Halloween, and to learn about special figures released in the economy line, click here.